I made a recycled book from a $2.00 used book as my travel sketchbook and showed it previously in a blog post. I've done some preliminary drawing/painting etc before we begin and wanted to add those pages to my blog now. 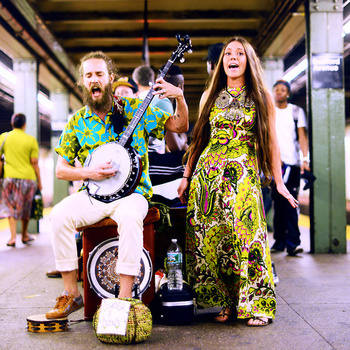 I love "trip anticipation" and these steps make the upcoming trip even more fun. Here is the cover of the book - and it has 32 pages of varying size watercolor folios mixed with some original pages of Atget's B and W photos. 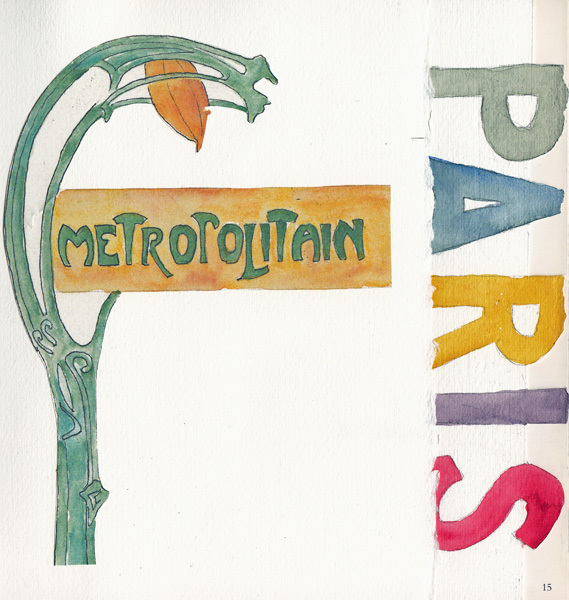 I sketched and painted a vintage Paris Metro sign in the Scupture Garden at MoMA this summer and decided to print it out and collage it for the title page of the sketchbook. I will add my identifying and contact information here. This is a small page and the word Paris is actually cut-out letters at the edge of the next page. 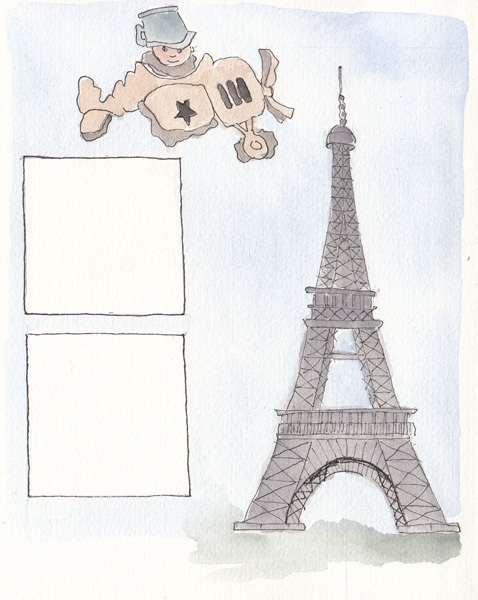 This is Page 2 - and contains Mickey - the Sendak traveler I put in all of my overseas travel sketchbooks. The two squares are part of the 2" paintings I do - one for each day of our trip. 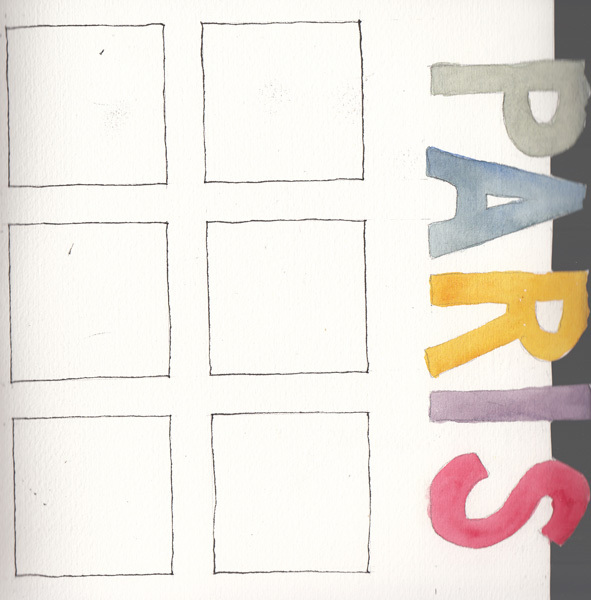 Here is page 3 with the cut-away Paris Letters and some more 2" squares for drawing. 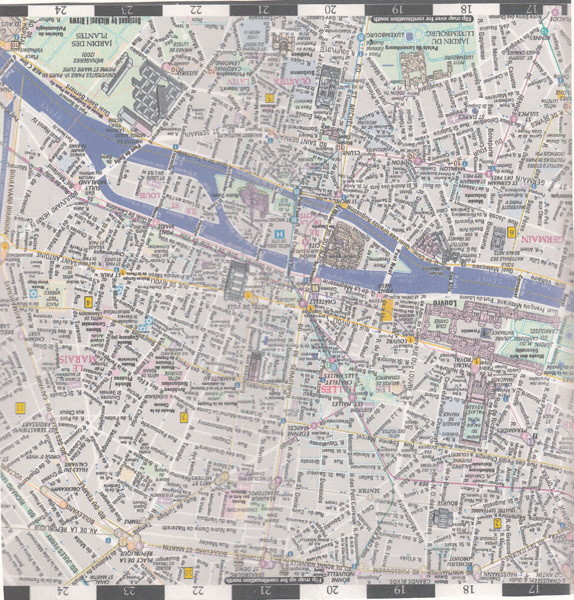 Page 4 is a scanned and collaged map of the center of Paris. I love maps and even still have one with all of our walks from our first 2 week trip there many, many years ago outlined in marker. 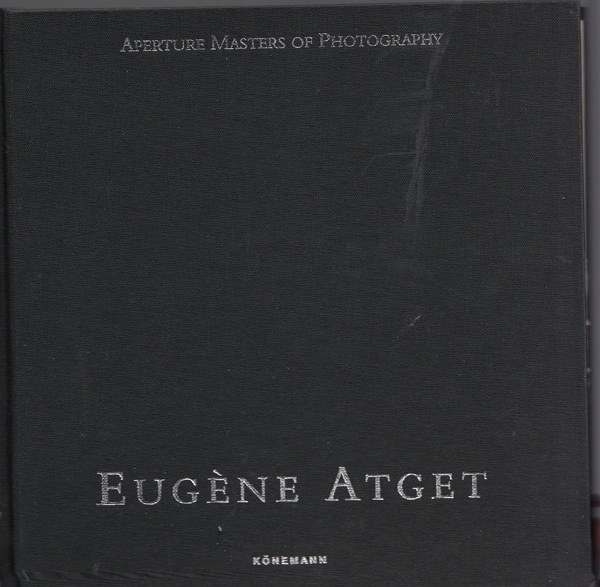 Page 5 is one of the original Atget page folios I bound into my book. 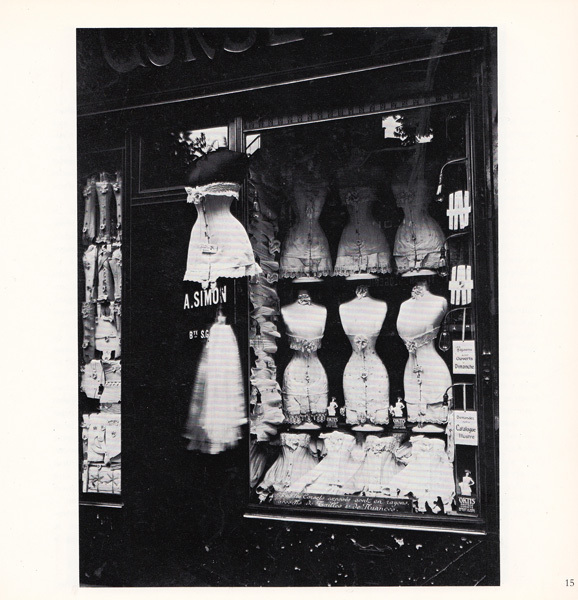 Don't you just love the old lingerie shop? Page 6 will have our itinerary, collaged over the original French text from the preceding page, with our rental apartment address. 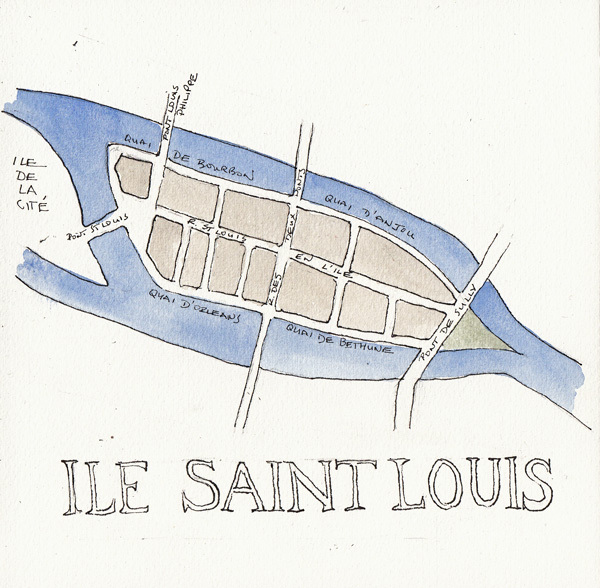 And Page 7 has my map of Ile St. Louis - the location of our apartment. The other places we frequent on the island will be added to this page when we arrive. We rented an apartment on Ile De La Cite several times and were thrilled to be staying now on the other island in a 17th C. building, above a boulangerie. 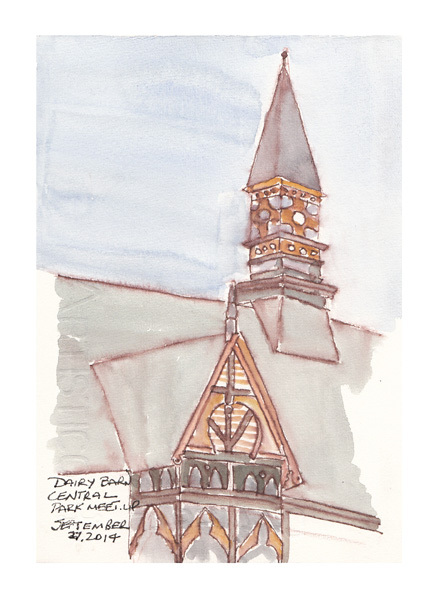 When I'm traveling with my husband, we walk lots and just stop at places that look interesting, and in the process I do quick sketches - painting them then or later in the day. I have no idea what the watercolor paintings will be like in this book, but I loved Koosje Koene's travel pages of what she wore that day - and what they ate that day! 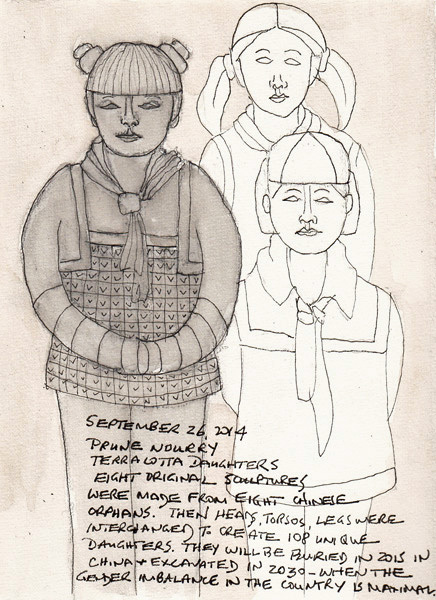 When we went to Venice in 2012, I sketched and painted the clothes I brought - inspired by a very old illustration from a travel sketchbook in an exhibit at the Morgan Library. And in Venice I did a painting of several gondoliers showing what they wore! 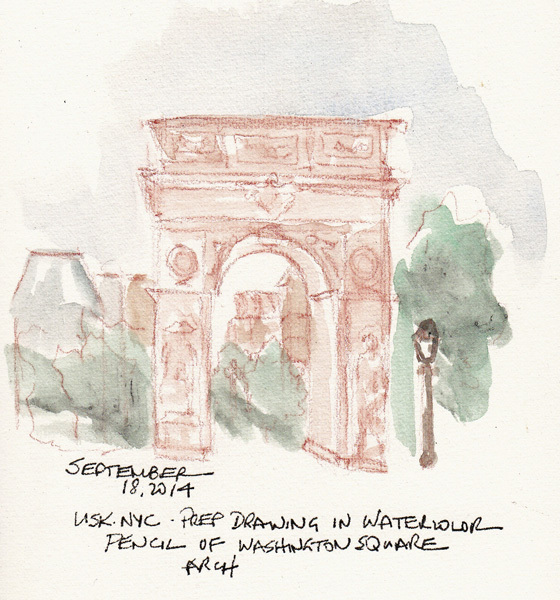 The last time I went to Urban Sketchers NYC Weekday Group we met at Washington Square in Greenwich Village. 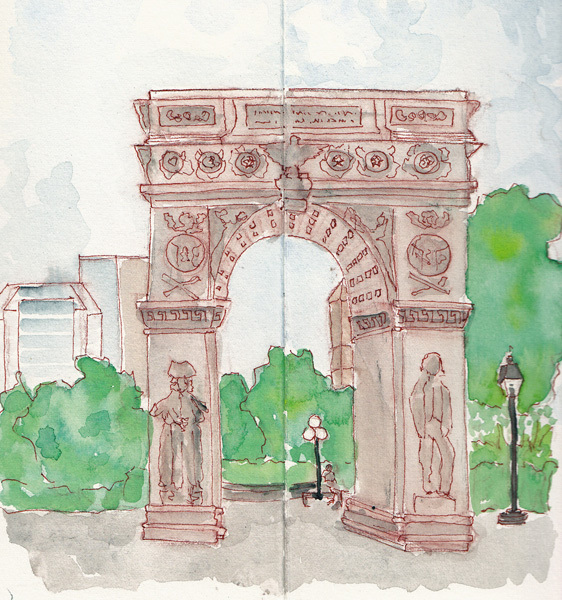 I sat across from the north side of the park and made a preparatory sketch of the Arch with a watercolor pencil. It is my new trick for approaching the drawing of famous landmarks that I find intimidating. Thank you Liz Steel! After I finished my second bigger sketch I went back and added water to my prep sketch and kind of liked the less defined lines. 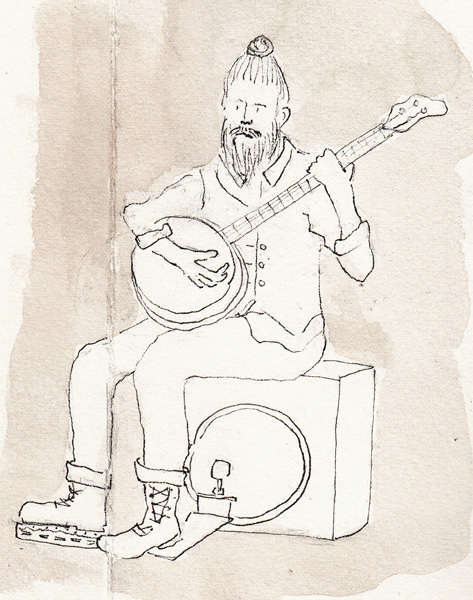 A musical duet played under the arch and I make a quick pencil sketch of the male musician/singer of Coyote and Crow. I intended to paint him later that day, but never got around to it. 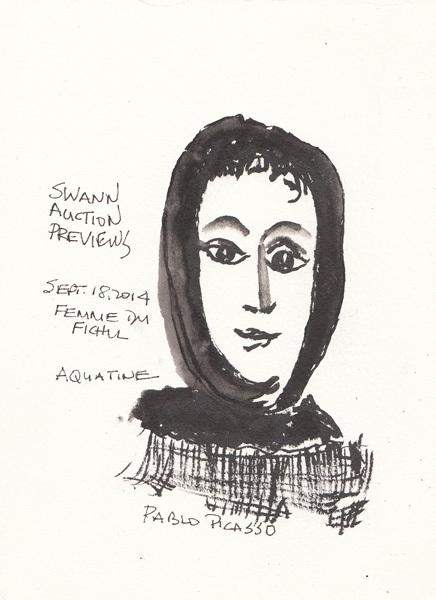 Pat, Benedicte, and I left early to go to Swann Galleries for the auction preview of 19th/20th C. and Modern Drawings and Prints. They had several hundred prints and drawings and it was hard to choose one to draw. This is an aquatint print. I sketched this quickly with a Pentel Pocket Brush Pen. Last Saturday was the first meetup group I've gone to since June and it was nice to be out with a big group of sketchers, all selecting views that were in the same areas. 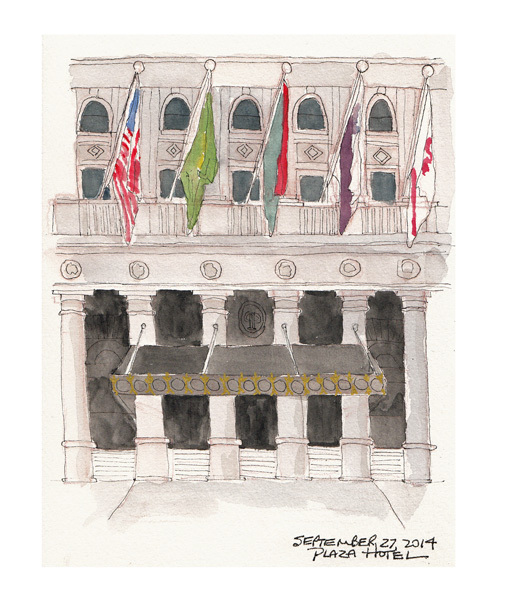 We met at Central Park South and 5th Ave in front of the Plaza Hotel. We draw for about 45 minutes then spread our sketchbooks for viewing and then move to the next location - for three 60 minute sessions. My husband and I were married when we were both in medical school - in different states - and while living on student loans. We had 12 guests at our wedding, a lovely lunch, in NJ, and then we came to NYC for 3 nights at the Plaza for our honeymoon. Someone Saturday asked if we had a room overlooking Central Park, and I laughed and told them we could only afford a room looking at a wall! This is just the entrance façade. 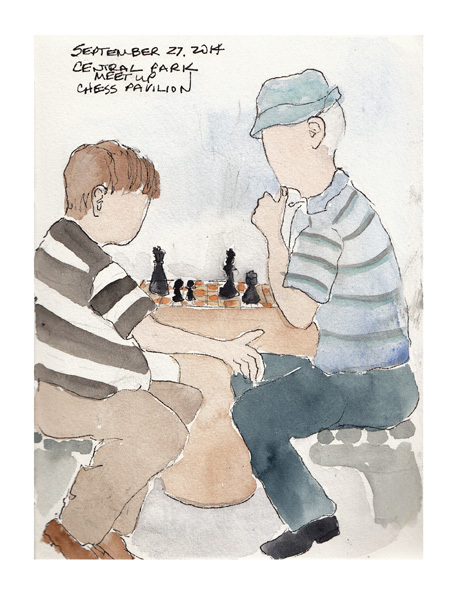 The group then walked into Central Park where I sketched two chess players in the Chess Pavilion and the near roofline of the Dairy Barn Visitors Center - which is a quirky painted building. I sketched in Tombow brown marker and then painted with watercolor. Today my friend Benedicte and I went to see a unique sculpture exhibit at an unfinished commercial space near the 9/11 Memorial. 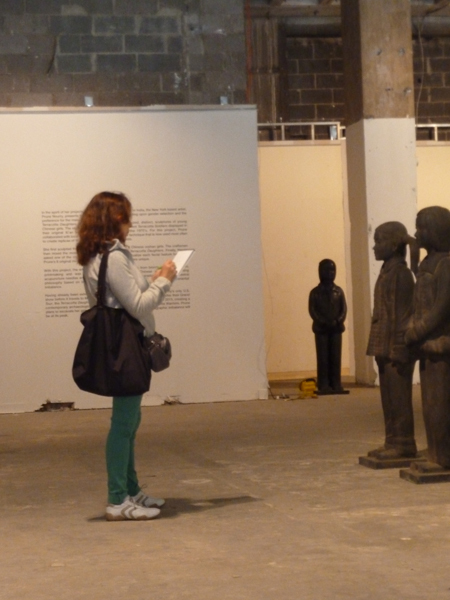 Prune Nourry created Terracotta Daughters to reflect upon gender selection and the preference for male children in China. 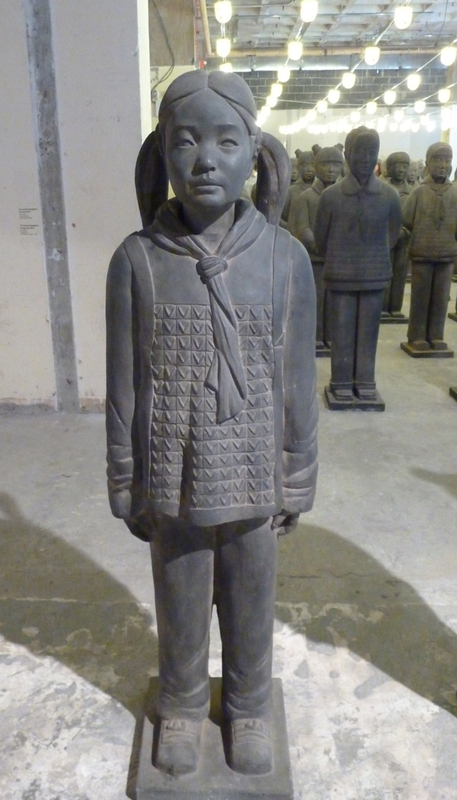 Eight Chinese orphan girls were selected as models for the sculptures. If I interpreted the movie correctly, Prune Nourry made clay models of each of them to use to make molds. Then the molds for heads, torsos, and legs were mixed and made into terracotta sculptures to make 108 unique daughters. 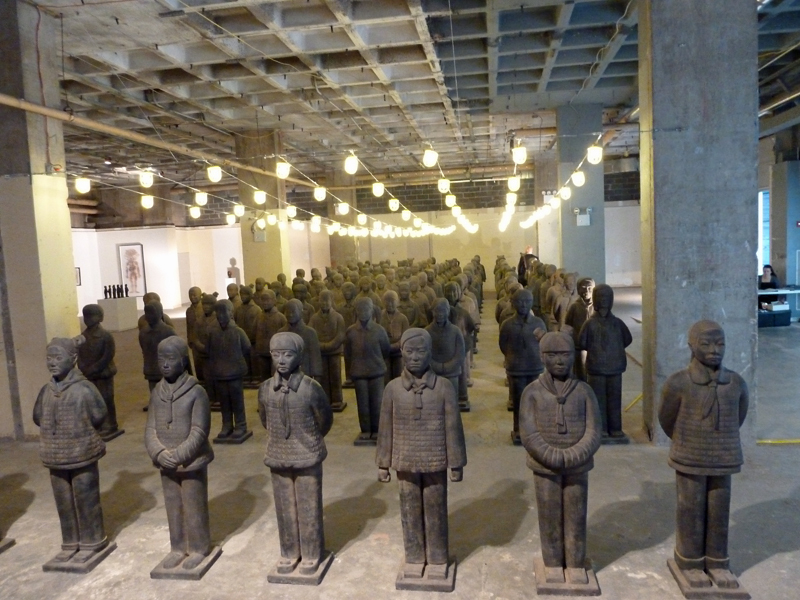 These sculptures will next be seen in Mexico City and in 2015 they will be buried in China, like the original Terracotta Warriors. 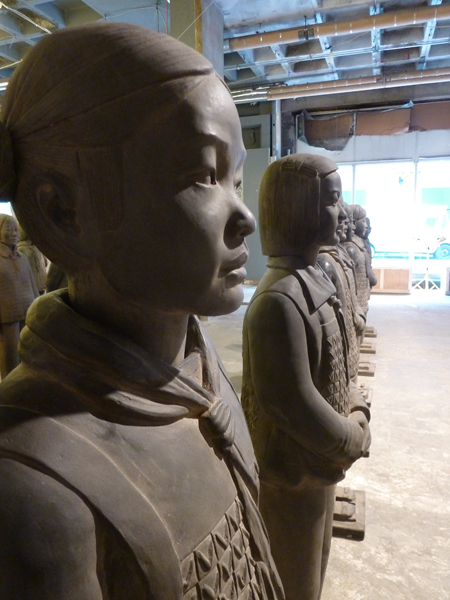 In 2030, the Terracotta Daughters will be dug up, at the time when the greatest gender imbalance will exist in China. 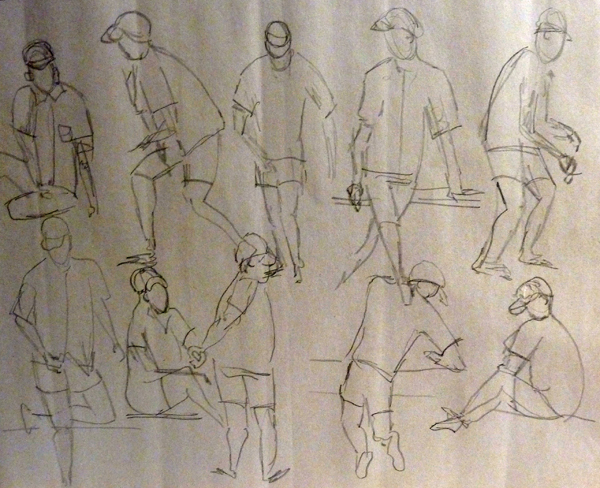 I started attending drop-in figure drawing sessions at the Society of Illustrators in New York City on September 16, 2009. This was a huge step for me, mostly because I had just retired and was finally ready. But I asked a friend to accompany me so she could ease me into a setting that she already knew. I loved it and set as my goal one session per month and was able to keep on that schedule until 2013 when I replaced my monthly drop-in sessions with a weekly Figure Drawing class at Fashion Institute of technology. Since then I have combined drop-in sessions at Society of Illustrators, Battery Park City (from May through Oct), and even Parsons. Last week at Battery park City we started with 30 second sketches for warm up and then did 10 one minute sketches of John. We usually begin with 2 minute sketches at Society of Illustrators and I was pleasantly surprised with my quick 1 minute gesture drawings. I couldn't do this before, so progress is being made!! !